Steve Rice (Olympia, United States) on 9 February 2018 in People & Portrait. When a family has small children, it's the best time for everyone. A small man's happy rush is seen far. AW!! This is cute ! How happy he loooks ! So cute and adorable Anders. I like his boots! An image and title that gave me a laugh. It's great to see kids letting loose and having fun. Très belle photo de ce petit bout plein d'insouciance. Qu'il la garde longtemps. Cute wild man. Wonderful portrait. Ha ha... awesome portrait moment! He will love looking at this when he's a grown man. :-) ...! Superb portrait of the wild man ! 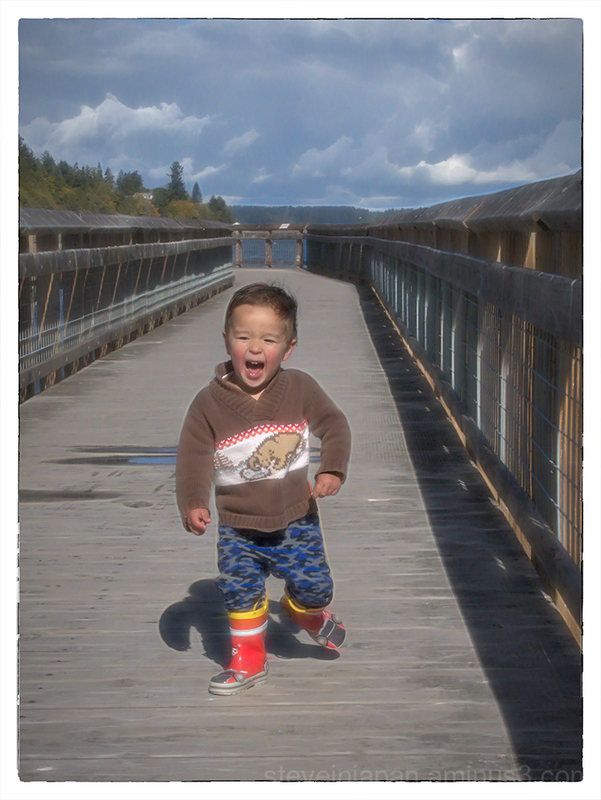 A fine picture of Anders enjoying his walk or romp down the bridge. J'adore superbe ta photo !!! 5* il est trop beau ! Excellent photo! The little boy is so lovely ! This is just too cute! Anders in action! I love those red boots! Oh what fantastic energy this photo holds! It's fantastic. I'm smiling SO big. I like this wild man !